BERRIEN SPRINGS, Mich. --- On Thursday, July 6, Seventh-day Adventist Michigan Conference President Jay Gallimore announced that all books containing words would be banned at the three Adventist Book Center (ABC) locations in Michigan. When asked what will fill the now nearly-vacant ABC shelves, Gallimore told concerned customers they’ll have their fill of adult Adventist coloring books. “The Steps to Christ Coloring Book is my personal favorite,” Gallimore said, holding up a well-worn copy, the words on the cover carefully concealed by what appeared to be black permanent ink. Gallimore is also hoping to collaborate with Pacific Press on a line of picture-only Bibles, though he acknowledges they have not returned his many phone calls and emails. “Your average Adventist member shouldn’t be reading the Bible anyway. That’s what leads to different interpretations. A plain reading conducted by your pastor is best. It’s for the church leaders to inform members what the Bible says and what it means,” said Gallimore, reading from his most recent email to the Adventist publishing house. To prevent wily customers from sneaking copies of Bible commentaries and devotionals out of dumpsters, the three ABC branches will each host book burning vespers under Gallimore’s strict supervision. Attendees are encouraged to bring any books, magazines, or journals from home to contribute. A preliminary edition of a hymnal containing only musical notes will be unveiled at the book burning as well, and all those present will be invited to hum along to the songs as they watch thousands of books disintegrate to ash. Words spoken are almost as effective as the written word. Let’s invest in plenty of duct tape too. Just think of all the $$$ saved. If pastors can’t share “Thus sayth the Lord” then they’ll have to find another means of livelihood. I actually don’t think this is funny. Quoting a President and making us look ridiculous (we can do that just fine on real issues). I’ve “liked” your blog but I think you’ve lost your sense of humor and gone into hurtful territory. I love a good joke just feel this is truly offbase. My reaction is to “like” your comment since it is, apparantly, satirical. However, it also mirrors the silliness that prevails in our nation so closely that I paused, wondering if it was a real reaction on your part! What a horrible time in which we live. Thank you BA, for relieving the stress with what, given the subject matter, is dark, dark humor. The only thing that isn’t funny about it is the close proximity of the story to actual events here in Michigan. Just not up to the level of sites like The Onion. Now Cecil’s response was more up to par for this sort of thing and made it a little more worthwhile wading through it all. 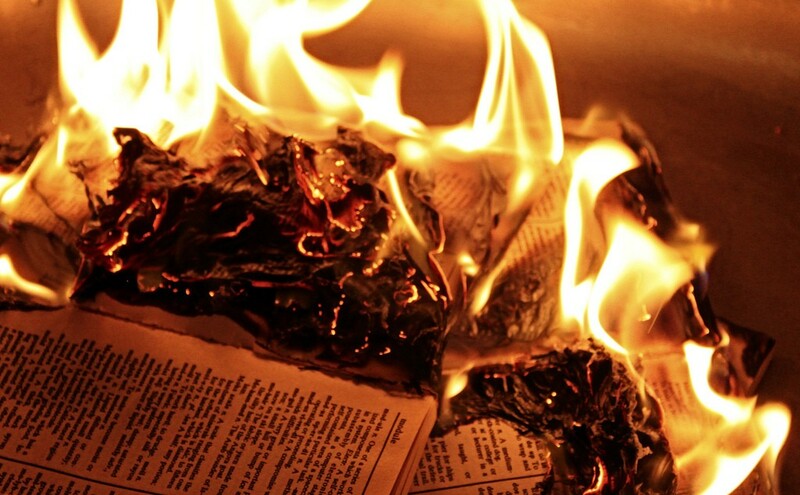 I get the joke but I’ve noticed that many hyperbolic SDAs are really comparing this to Germany’s book burnings when it really looks more like an elementary school banning The Adventures of Huckleberry Funn or a Principal shutting down the comments of a valedictorian. I of course know this is all tongue-in-cheek. But I will reply a bit to the real news. When I choose which books to sell, I am not banning the books I choose not to sell. When I discontinue carrying a book, I am not banning it. I am merely working to see that my line-up of products matches my values as a salesman. You can sell the other books and I won’t stop you (though I might opine that you aren’t doing wisely). So to say that the Michigan Conference banned Knight’s books is being media-savvy by silly otherwise. More accurately, the conference decided for a time not to promote those books by selling them in their stores. Even I can see that this is stupid. The “fittest” blogs will survive; the weak ones will fade away. The whole reason they banned George Knight’s books is because he supports the Biblical truth that God ordains men and women equally. Even Ellen White taught that truth. Ted Wilson should be required to listen to George Knight’s sermon 100 times, at http://www.EqualOrdination.com and maybe he would start to understand the truth. Sounds about right for the Michigan!